I recently discovered the cooking/baking blog, Two Peas in their Pod. It is a blog by a cute married couple who both enjoy cooking. What a wonderful thing. Paul and I used to cook together when we had our huge kitchen at our first apartment. Ironically, now that we live in a house we have a microscopic kitchen! It is a romantic thing to do, cook dinner together and drink some wine….. sigh. Anyway, the first recipe I tried from their site was Roasted Butternut Squash Orzo Salad. It was really tasty, craisins, spinach, roasted butternut squash,… can’t go wrong! I never got around to taking a picture of it unfortunately, so I didn’t get to post about it, but I wanted to give it a shout out! I highly suggest making it. 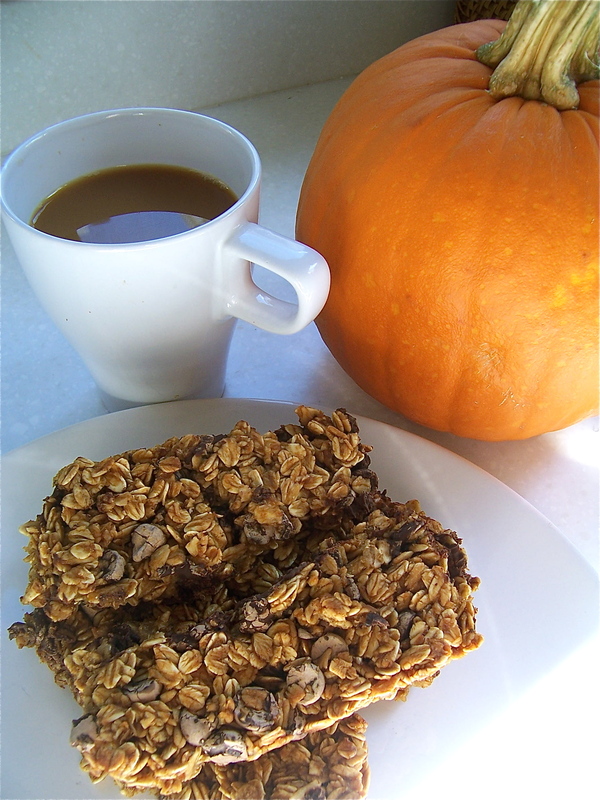 I went back to their site the other day and came across this recipe for pumpkin chocolate chip granola bars. 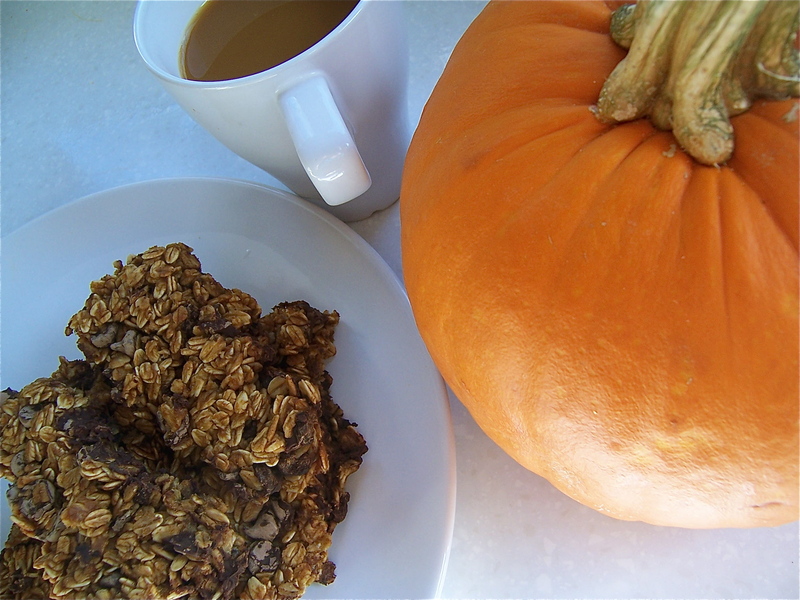 I love homemade granola and I love pumpkin, so these were calling my name! I love having something easy to eat in the morning for my initial wake up with the baby, which nowadays is around 6am. I actually eat two breakfasts most days! Something small when I first wake up like a muffin, banana, or one of these granola bars, and then around 10am I actually cook something. This week I have been big on making cheese-less omelets with chopped red onion and roma tomatoes and a piece of multi-grain toast. So good, I don’t even miss the cheese! I just realized I am talking about a lot of other food in this post, so back to the granola bars! These are SO good, especially if you are a freak for fall flavors, like me. I made them at night, and the next day they tasted even better, I could taste the pumpkin and spices much more. Like most homemade confections, homemade granola bars are infinitely better than their store bought counterparts. No preservatives, no random weird ingredients, and of course they taste so much better! I will definitely be making these again! Preheat oven to 350 degrees F. Spray an 8 by 8 baking pan with cooking spray and set aside. I used 9×9 and it worked just fine. No matter how many pans I have, I never seem to have the right size for recipes! In a large bowl, whisk oats, spices, and salt together. Set aside. In a medium bowl, whisk brown sugar, pumpkin, applesauce, honey, and vanilla extract until smooth. Pour over oats and mix well, coating all of the oats. Stir in chocolate chips. Press oat mixture into prepared pan. Bake for 30-35 minutes or until golden brown. I kept mine in for 45/50 minutes for fear of having mushy falling apart bars! They turned out nice and chewy! Remove from oven and let cool on a wire rack for 5 minutes. Cut into bars. Remove from pan and let cool completely. I warn you, they are addicting! Thank you for the great recipe, Two Peas in their Pod! 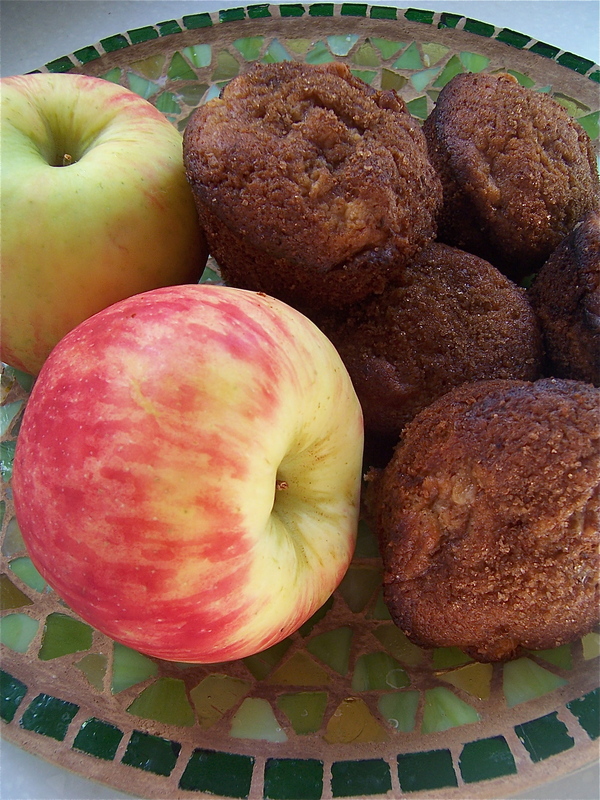 Nigella’s Apple Cinnamon Muffins+ OMG I met Nigella! Oh Nigella, how I do I love thee? Let me count the ways! 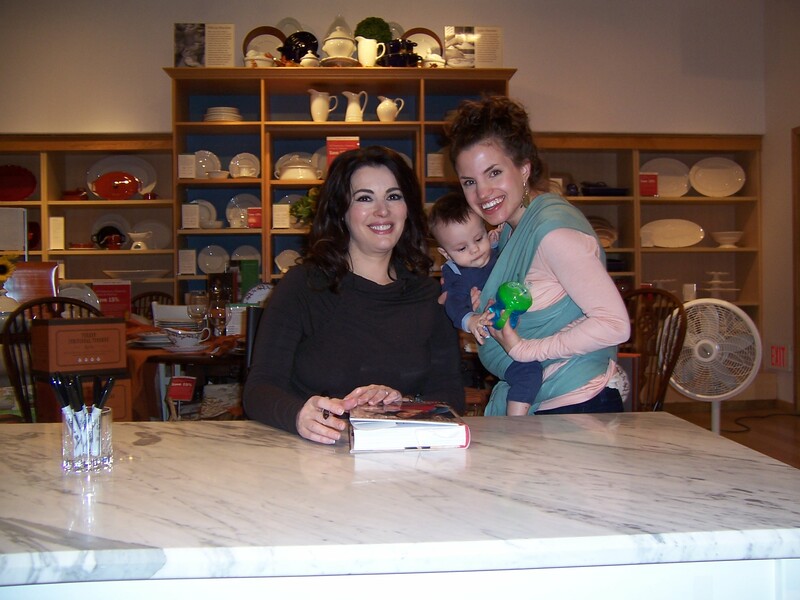 I was so excited for Nigella Lawson’s new cookbook, “Nigella Kitchen.” I was even more excited when my friend and fellow Nigella follower, Sunny asked me to go to Williams-Sonoma with her for a “Nigella Kitchen” book signing! She is hands down my favorite celebrity chef. As I have said before, I love the way she writes her recipes. I how charmingly homemade they are. She is all about cooking as an act of love and is the total opposite of cooking snobbery. I feel the romance of cooking and baking through her words. And, of course, every recipe I have ever made from one Nigella’s cookbooks is wonderful. All of her recipes are what I refer to as “make again recipes.” Some new recipes are good, but not so good that I would bother to make them a second time. Nigella’s are always second-timers, and third, and fourth, and so on. This makes me happy, because I am always looking for new dishes and desserts to add to my repertoire. 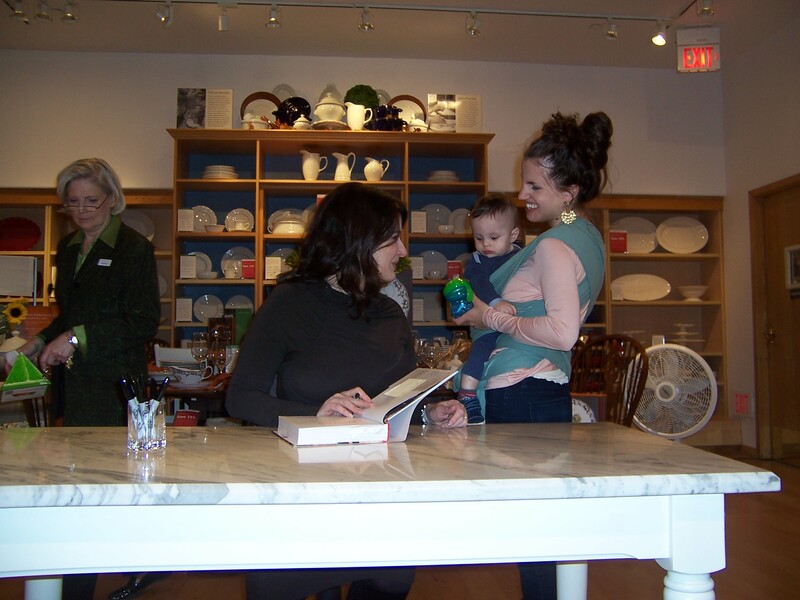 So, lucky us, we made it through the line and got to meet The Domestic Goddess with my 6 1/2 month old and Sunny’s 6 week old baby! We even got bumped up because my little LoveBug was getting hungry and ticked off and wanted everyone to know it! Thanks Buggie! Meeting her was surreal! It’s kind of fog now and I have since thought of a plethora of things I coulda woulda shoulda said to her. But, what an awesome experience! Nigella is beautiful, kind, and sweet. True to her charming way with words, when she saw little 6 week old Sasha she declared, “This one is freshly hatched!” Ok, I think I am done gushing. Oh no, just kidding. One more thing, the cookbook is great! Beautiful photos, beautiful words, and beautiful food. Nigella talking with Elijah! His first celebrity meeting! Preheat oven to 400 degrees F and line muffin tin with paper cups. Peel, core, and cut apples into small pieces, about ¼” (as Nigella points out, please don’t measure!) and put them aside. If you are adding the almonds give them a rough chop and add half of them to the flour mixture. Put the other half of almonds in a small bowl with the other tsp. of cinnamon and 4 tsp. of brown sugar, mix together to make the topping. I just used the cinnamon and brown sugar and it was quite yummy. Fold the wet ingredients into the dry. Add the chopped apple. Do not over mix! Lumpy is good! Spoon the batter into the muffin cups and sprinkle the topping over them. Place in preheated oven and bake for about 20 minutes or until muffins are risen and golden. Take pan out of oven and let muffins sit in the pan for about 5 minutes before taking out and placing on a cooling rack. The first homemade, from scratch pancake recipe I ever made was Nigella Lawson’s “American Breakfast Pancakes.” They turned out about a million times better than the pancakes from a box mix that I was accustomed to, I could never go back! I tried a few other recipes, but kept coming back to Nigella’s- she is after all, The Domestic Goddess. The recipe has evolved significantly, but I feel I still must give credit to Nigella for being the rudiments of my recipe. I think the only things that are the same now are the baking powder amount, the egg, and, the butter. I add cinnamon (of course, what don’t I add it to?! ), vanilla, baking soda, replace the milk with rice milk (I used to do buttermilk when I could have dairy), and I substitute half of the all-purpose flour for whole wheat flour. As I stated in my pumpkin pancake recipe, I think subbing half of the AP flour for WW makes pancakes heartier, more flavorful, and more filling, not to mention healthier! 1 1/3 cups milk, rice milk, buttermilk, whatever you prefer! Melt butter in a small bowl and allow to cool for a few minutes. Meanwhile, whisk all dry ingredients together. Next, I make a little valley in the middle of the dry ingredients and dump in all of the wet ingredients and mix (I still use a whisk). Do not overmix! Slightly lumpy is ok! Poor some of the batter onto a skillet over medium/low heat and spread out a little with a spoon or the whisk . Place your mix-in on top of pancake batter. Cook until pancake is bubbly all over. Flip over with a spatula and cook for another minute or two. Serve however you like them, syrup, whipped cream, honey, the possibilities are endless! A waffle by any other name would still taste as a sweet, but “Waffles of Insane Greatness” perfectly captures the um, well… insane greatness of them. I have officially scrapped my other waffle recipes and declared this one the be all end all of waffle options. This recipe has been sweeping the cooking/baking blogosphere, and when you taste them you will know why! Waffles of Insane Greatness were first featured on the Food Network show “$40 a Day” with Rachael Ray and hail from a restaurant called Aretha Frankensteins in Tennessee. Here are a few of my favorite things about WIG (heh- the acronym is kind of funny)- the recipe is ridiculously easy, especially in comparison to other waffle recipes, they are crispy on the outside and soft and chewy on the inside, and the taste is sweet without being over the top sweet. I changed three things about the recipe. 1.) I doubled it because the original only made 3 waffles in my iron, plus I love having extras to freeze and pop in the toaster later in the week! Instant satisfaction! 2.) As a substitute for buttermilk I mix 3 tablespoons of apple cider vinegar with 2 cups of rice milk and let it sit while I prepare the rest of the ingredients. 3.) I do not let the batter sit for 30 minutes prior to making the waffles. I have a six month old, extra time is just not in my vocabulary! They still taste so good, but perhaps one day I will prepare the batter ahead of time to see if it makes a difference. In a medium bowl, combine the flour, cornstarch, baking powder, baking soda, and salt; mix well. Add the milk, vegetable oil, egg, sugar and vanilla and mix well. Let the batter sit for 30 minutes, if you have the time. If not, don’t sweat it, mine turn out great without sitting. Preheat a waffle iron. 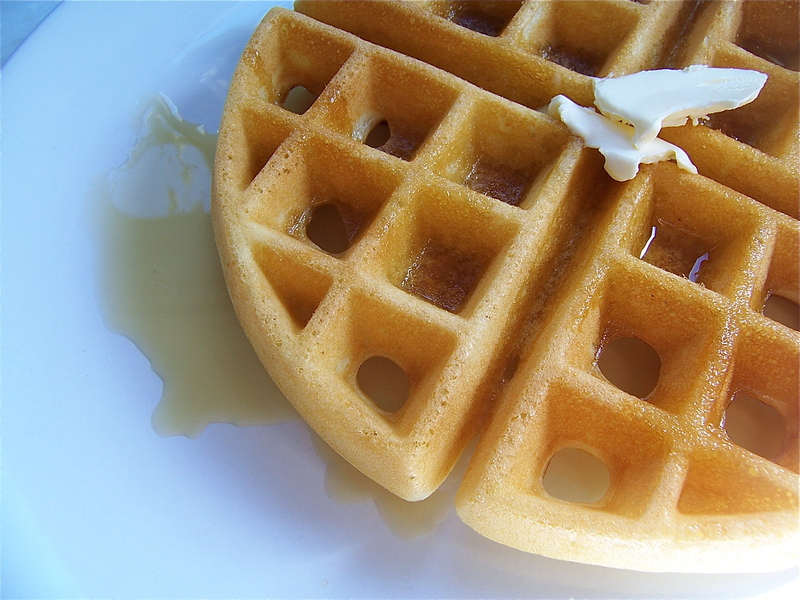 Do not use non-stick spray on the waffle iron; the oil in the batter will allow the waffle to release easily. Follow the directions on your waffle iron to cook the waffles. Serve immediately with butter and syrup. In a week’s time I have made pumpkin bread, pumpkin spice syrup, and pumpkin pancakes. Oh, and I was still raring to go, but darn Trader Joe’s was out of their wonderful organic canned pumpkin. Now, I know I could have gone in search of a sugar pumpkin and make my own puree, but although I love DIYing in the kitchen, I just don’t want to add another thing to my to-do list right now! So, sadly my pumpkin creations are at a stand still. 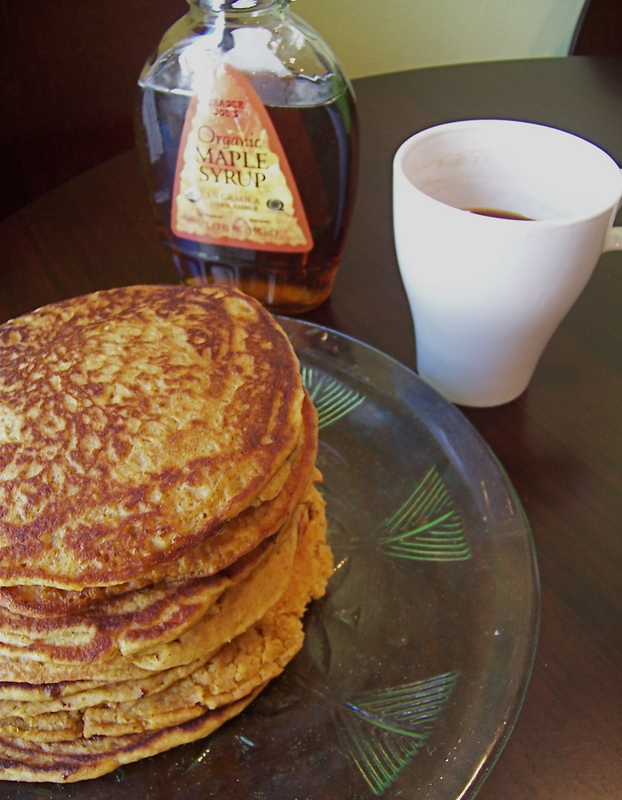 Meanwhile, let me share this recipe for Pumpkin Pancakes. I made these for my friend the other day when she came over for breakfast and her review was that they are “better than a restaurant.” They are definitely perfect on a fall morning. Not only is the flavor clearly in line with the season, but they turn out a beautiful rusty orange color. I must admit, I did not get a good photo of the pancakes. I was so hungry and anxious to eat them that by the time they were done I honestly just did not have the patience to take lots of photos. However, I am compelled to share the recipe because they are just so good! 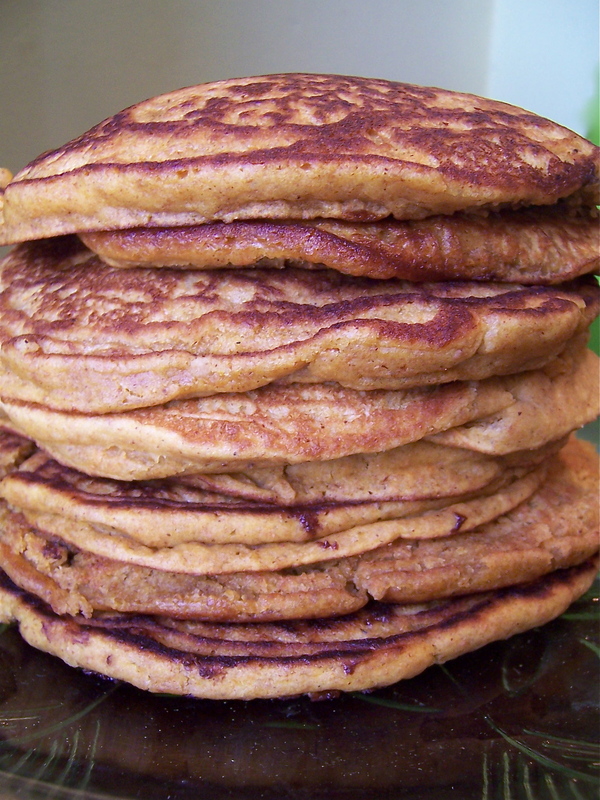 If you like pumpkin bread and you like pancakes, you will love these! I am also excited, because the recipe is my own. You may now call me Breakfast Queen 🙂 You can lower your guilt, because they are half whole wheat flour. I think whole wheat makes pancakes heartier and more filling, but I like to keep some all-purpose flour in the recipe to keep the pancakes fluffy. If you are a boxed pancake mix person, just stop right now. Once you make homemade you will never go back. 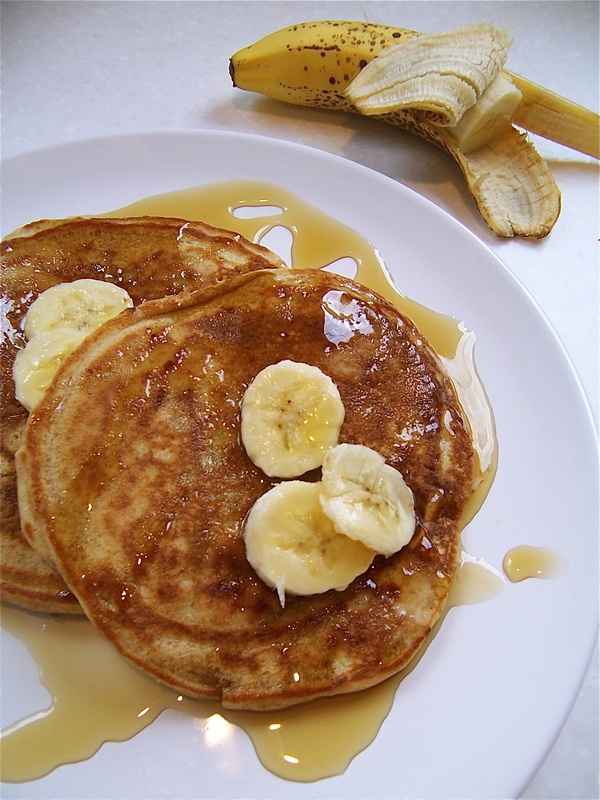 Homemade pancakes have more flavor, are thicker, and fluffier. And, guess what! It took me a maximum of 5 minutes to put this batter together! In a large bowl whisk together dry ingredients. In a separate bowl whisk together wet ingredients. Gently fold wet ingredients into the dry. Do not overmix, pancakes turn out dense and tough if you overmix! Heat butter on a griddle or frying pan over low/medium heat. Pour batter on hot griddle. When pancake begins to bubble all over use a spatula to flip (about 2-3 minutes). Cook the other side for only a minute or so. The weather in Philadelphia has been pretty terrible for the past week. Minimal sunshine, rain, humidity, and other nastiness. Very inopportune for photographing my recent adventures in the kitchen. Bummer! Luckily, I did manage to get a few photos of these Ultimate Ginger Cookies when I made them the other week while the sun was still gracing us with its presence. As soon as September draws near I get in the mood for fall baking. It doesn’t matter that it has been a balmy 90 degrees for much of the month, I want all things pumpkin, cinnamon, apple, nutmeg, and so on. Paul (the BF) actually asked me, yesterday, “What’s with you and pumpkin?” Well, you other autumn enthusiasts get it, don’t you?! I feel all warm and fuzzy the first time I see a display of pumpkins and mums at a store in September. I am IN LOVE, madly deeply in love, with the pumpkin spice latte. It’s like a hug in a cup. Anyway, these cookies are definitely a fall and/or winter treat. I actually bought the crystallized ginger for the past two summers in preparation for the first cool day when I could justify baking them. By the way, I get my crystallized ginger from Penzey’s Spices, also my favorite place to buy spices from. The feeling I get while leafing through their catalog is equivalent to that of a child looking through a toy catalog. If you cook and bake a lot I definitely suggest checking them out, you will notice a difference in the quality and potency of their products. I can’t go back to regular old grocery store spices. I am a spice snob, I know. 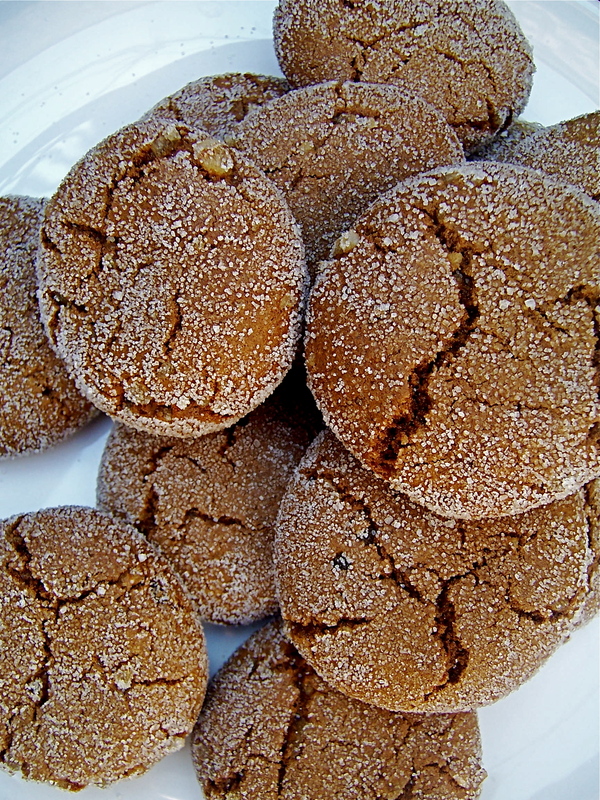 Anyway, if you don’t have crystallized ginger, these cookies will still be delish without it. I saw Ina Garten make these on her show a few years ago and knew instantly I wanted to make them, but it was summer and I wanted to wait for fall. Then I saw them on Brown Eyed Baker, I food blog that I love. I felt it was fate. I patiently… er… impatiently awaited the right time to bake them. This was my second year making them and they were as good as I remembered. I think I will add them to my Christmas cookie baking list this year as well. They are soft and chewy, sweet and spicy, a perfect recipe (as is expected from The Barefoot Contessa). Preheat the oven to 350 degrees. Line 2 cookie sheets with parchment paper. In a large bowl, sift together the flour, baking soda, cinnamon, cloves, nutmeg, ginger, and salt. In the bowl of an electric mixer fitted with the paddle attachment, beat the brown sugar, oil, and molasses on medium speed for 5 minutes. (I do not have a stand mixer, so I just used a regular hand mixer and it worked fine!) Turn the mixer to low speed, add the egg, and beat for 1 minute. Scrape the bowl with a rubber spatula and beat for 1 more minute. With the mixer still on low, slowly add the dry ingredients to the bowl and mix on medium speed for 2 minutes. Add the crystallized ginger and mix until combined. Scoop the dough, I used an ice cream scooper. With your hands, roll each cookie into a 1 3/4-inch ball and then flatten them lightly with your fingers. Press both sides of each cookie in granulated sugar and place them on the sheet pans. Bake for exactly 13 minutes. The cookies will be crackled on the top and soft inside. Let the cookies cool on the sheets for 1 to 2 minutes, then transfer to wire racks to cool completely. Bite into a cookie and savor the warm fuzzy feelings. This recipe was shared with me by another mom who is dairy-free for her baby and also happens to be a vegetarian! We email eachother yummy recipes that fit our dietary needs. Thanks Katherine! As soon as I saw chickpeas in the title I was all over it. They are definitely my favorite bean! And roasted vegetables…. mmmm. Roasting vegetables is a huge flavor enhancer. They get sweeter from the the high temperature baking, and they get a nice golden brown exterior which is equally aeshetically pleasing as it is delicious. Something you may start to notice is that I tend to eat pretty healthy when it comes to lunch and dinner, and totally indulge when it comes to dessert. Breakfast goes both ways depending on the day. Well my friends, balance is very important! If you are an active person and eat well you can afford to indulge here and there. I honestly eat something sugary and sweet everyday, but not all day everyday and my meals are very healthy. I also take long walks with my little Buggie almost everyday. Balance! I like to eat healthy and am very interested in nutrition, but I sure do appreciate a good cookie, cupcake, or muffin! Anyway, this is one of those tasty, but healthy meals that in my opinion makes it okay that I ate two brownies the same day! Preheat oven to 450 degrees. In a large bowl toss carrots and cauliflower with cumin and 2 tablespoons of oil. Season with salt and pepper. Spread vegetables on a baking sheet (or 2 if need be). Set the bowl aside, you will use it again later. Roast veggies until browned and tender, 25-30 minutes, rotating sheets and tossing halfway through. Due to a fussy baby I did not toss nor did I let them get quite as brown as I would have liked! Cool to room temperature. Meanwhile, in a small/medium saucepan, bring 1 1/4 cups salted water to a boil. Stir in couscous; cover and remove from heat. After 5 minutes take cover off and fluff with a fork; set aside to cool. To make the dressing, whisk together the lemon zest and juice and remaining tablespoon oil; season with salt and pepper. 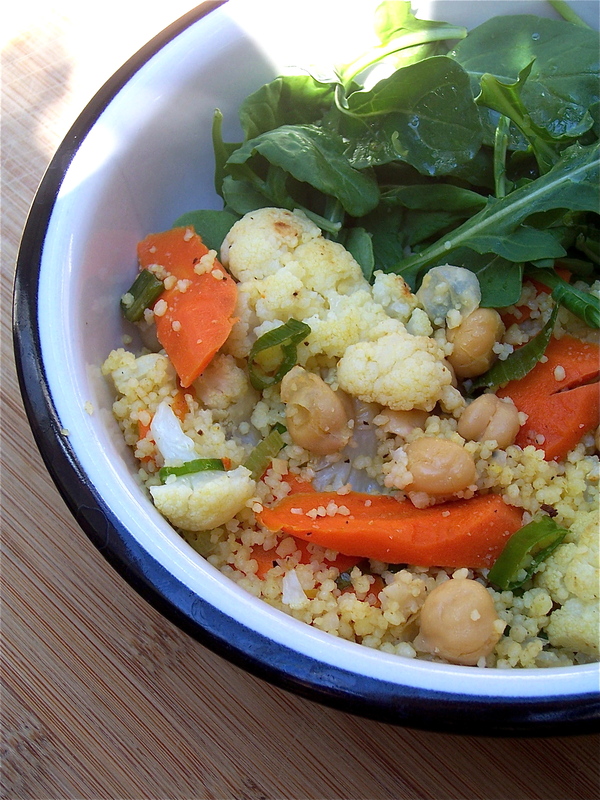 In the large bowl you tossed the veggies in, combine roasted vegetables with couscous, chickpeas, and scallions. Place arugula on a serving platter or bowl and drizzle with 1 tablespoon dressing. 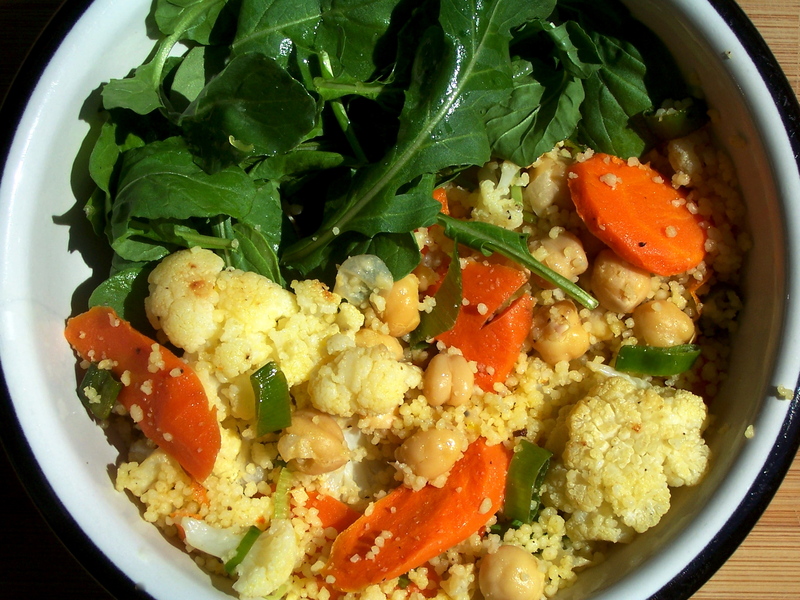 Add remaining dressing to couscous mixture, and toss; serve over or to the side of arugula. Eat your veggies and feel good!